Networks for basic services (communication, transportation, energy, water, education… aka the “infrastructure”) are in dire need of repair. I’d like to write a few articles about creative solutions, borrowed from various sources, that could take a big step toward fixing America. #1 and #2 and maybe #5 on the list above could probably be resolved by a basic income program like the one being considered in Switzerland, in which every adult citizen would receive an unconditional, tax-free monthly payment of 2,800 francs, or 2,500 US dollars. That income would put a single adult or a couple with two children just above the Swiss poverty line. A couple with no children would be well above the poverty line. To Americanize the Swiss program, and to keep things simple in our calculations, imagine giving every adult American, say, $1,000 a month in basic income. That income alone would raise most people above the poverty line and would keep everyone else with no additional income at least near the line. Naturally, most American adults would continue to work and invest and make money in addition to their basic incomes… and they’d live well above the poverty line. Single parents and couples with lots of kids, especially those living in more expensive states (e.g. Hawaii and Alaska), would fall below the poverty line and might need extra income (from jobs, for example), but most people would have enough to subsist if they had no money coming in other than the basic income. A basic income would be to the American public what baked potatoes would be to a hungry crew. Everyone gets a baked potato. No one goes hungry. Diners who want to start piling on the toppings… adding meat and vegetables and desserts to their meals… they would do that by generating normal income from jobs, careers, sales, services, and investments. Suddenly, virtually overnight, everyone is getting by… and more people have more opportunities to flourish. There are other problems… mostly related to the vast amount of money involved in giving everyone a basic income. Without getting too complicated, let’s do the math… to see if basic income is viable here in the States. Currently there are about 241 million Americans age 18 and over. For each to receive $1,000 a month ($12,000 a year), the government would pay just under $3 trillion a year. The entire federal budget is about $3.8 trillion, so the first thought is… no way can we afford that! To put these figures into perspective, the total wealth in America is sometimes estimated at around $100 trillion… so the entire federal budget represents only 3 or 4 percent of America’s overall wealth. That said, let’s see how we can come up with the $3 trillion needed to fund a basic income program. First off, we should probably start cutting back government spending programs that would become obsolete once a basic income program is in place… so let’s start there. Courtesy, White House Office of Management and Budget, and the National Priorities Project. 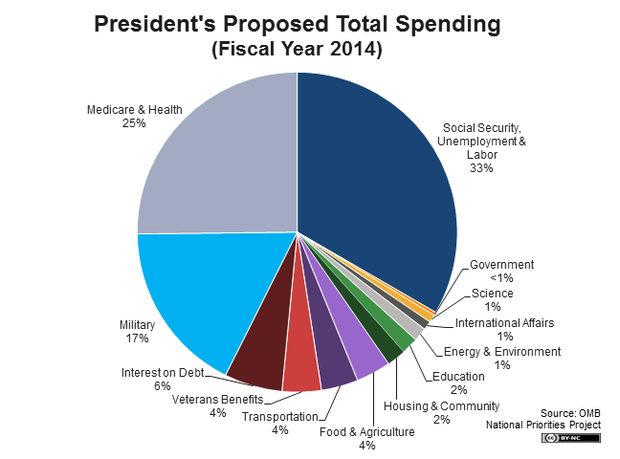 To implement basic income we’ll need to start chipping away at Mr Obama’s spending chart. The first step is easy: Once everyone has a basic income, we can cut way back on social security and unemployment… the lion’s share of the federal budget. That could provide a trillion dollars right off the top! So, now we need only $2 trillion to make this basic income idea viable. Next on the chopping block: Health care, the military, and the national debt… which together account for about half the federal budget. I believe it’s reasonable to cut each of these sectors by more than half… let’s say by 65 or 70 percent. That would provide another trillion dollars or so to pay for basic income… if we could do it. So let’s take a look at these three items individually. Health care. A basic-income test program in Manitoba, Canada, called “Mincome,” found that health care costs dropped by about 10 percent. There were fewer stress-related illnesses, fewer injuries from car accidents and domestic violence, and mental illness saw a sharp decline. On top of that, looking at a future US program, once older Americans start receiving basic income, Medicare benefits could be cut dramatically. So, between the 10 percent drop in health care costs inherent in the basic income program, and the additional drop by reducing Medicare, we’d probably be able to achieve our goal of cutting the “Medicare & Health” section of the chart by more than half. If not, at the risk of being simplistic… here in the States we could further reduce health care costs by adopting a two-tier system. Tier 1 would provide very basic, affordable services to everyone, including low-tech procedures like X-rays. Nothing fancy. No pricey, brand-name pharmaceuticals, no high-tech machines and procedures that are the pride and joy of modern megabuck American hospitals. Tier 1 healthcare would be like the traditional family doctor and nurse, plus a multilevel initiative (propagated through families, schools, communities, states, and the nation at large) to promote healthy life styles. Tier 2 would provide extravagant medical services, mostly to those who can afford them. Elite medical care at its finest. The general public would have access to Tier 2 only in extreme (especially life-threatening) situations… but not as a matter of routine health care. So, a two-tier health care system could be adopted… only if needed, to cut that big, gray slice of the pie chart by 65 or 70 percent… but it probably wouldn’t be needed. Military. I’d hope a lot of military spending could easily and realistically be cut… at the risk of irritating the brass… who seem to irritate easily… cruisin’, as they perpetually are, for someone’s bruisin’. I think it’s about time for us (humanity) to start dealing more effectively with our savage side, which will be the subject of another of these solution-oriented articles. I need to mention it here since it will play a big role in cutting the military down to size. Dress it up with ribbons all you like, the main role of the US military in recent years has been to spread savagery in the world. It’s kicked over hornets’ nests throughout most of the Middle East, giving Islamic militants a raison d’être and a justification for terrorism. That, in turn, gives the US military justification to further spread its savagery. It’s become a vicious cycle. All this viciousness and savage behavior needs to be nipped in the bud… and cutting the US military budget by 65 percent to help support a basic income program would be an excellent place to start… IMHO. Interest on the national debt. Paying off the national debt’s a little trickier. There’s nothing there to cut. We simply have to pay it… and that leads into the next phase of funding a basic income program. After cutting social security, unemployment insurance, health care, and the military down to manageable proportions, we’ll still need about a trillion dollars more to pay for the basic income while at the same time paying off the national debt, which is currently climbing above $17 trillion. And that’s where the overall American wealth—100 trillion dollars—comes into play. Raising enough money to add $1 trillion dollars more to a basic income program and to start paying off the national debt would have to be done, clearly and simply, by raising taxes. And with $100 trillion at our disposal, it’s easily doable. As always, once we can overcome the fear and start to use our money more wisely, the future is bright indeed! So, every adult would receive $1,000 of basic, tax-free income. That’s the baked potato that gives basic, unconditional sustenance to the American public. Beyond that, all of the toppings and meats and casseroles and desserts would simply become more expensive because they’ll be more heavily taxed. Along with the obvious inconvenience—cutting into our pocketbooks—rising taxes and higher prices will have a number of advantages. It’ll increase the work incentive while strengthening and tightening up the real economy, which consists of people and products (forget about money for a moment; it’s just a symbol). People will be more eager to find good-paying jobs… to get educated… to raise smaller families… to find creative ways to make money in order to buy good stuff…. More importantly, and on a bigger scale, raising taxes on the back of a basic income program will quickly shrink the monstrous, growing gap between the rich and the poor in America, getting it down to a comfortable level. We have to talk about money at this point, and that can get a little complicated… not to mention boring. Sigh. To make it more fun and easier to understand, let’s make it metaphorical. 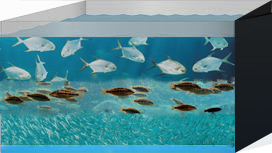 Imagine a huge aquarium tank filled with fish, which represent the American people. The water represents all the American people’s money. At the top of the tank are a few huge fish, representing America’s richest. As you move down through the tank, the fish get smaller and smaller… until at the bottom there are lots and lots and lots of tiny, tiny fish swimming around. These are America’s poor. All of the fish swim around the tank, all staying at their appropriate depths, pulling water into their mouths (earning) and pushing it out through their gills (spending). The big fish, naturally, can pump a lot more water through their gills than the small fish can. To avoid a messy metaphor, let’s say the fish don’t have to eat or go to the bathroom, they just swim around in the tank, pumping water through their gills as they go. The rich have to stay near the top of the water, and the poor have to stay at the bottom. 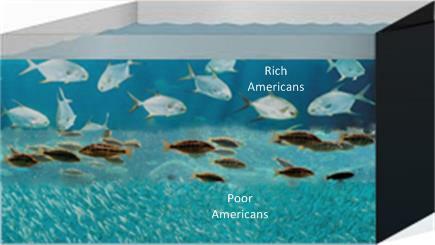 Middle income people stay in the middle of the tank.They all have to stay at the appropriate depth, determined by body size (wealth). Now we notice there’s a small, secondary tank attached to the big tank by a couple of rubber tubes, and that secondary tank also has water in it, but no fish. One tube pulls water out of the aquarium and into the smaller tank, and the other tube pumps water back into the aquarium. The small tank is mainly a holding tank. It represents the federal budget. If the big tank has $100 trillion in water, and the small tank has $3.8 trillion in water, you can imagine the relative sizes of the two tanks. Let’s take a closer look at the bottom of the tank. We notice that some of the fish at the very bottom are so small that they can’t take the pressure down there… and they die. To solve that problem, we insert a wire screen to cover the bottom and raise it up to a level where every fish is big enough to survive the pressure. That screen represents basic income in the fish tank. Finally, if you drain more water from the aquarium into the holding tank (raise taxes), you not only get more tax revenue to pay for basic income and to pay off a big chunk of the national debt, but you also shrink the gap between the big fish (the rich) and the small fish (the poor). Draining some water (raising taxes) provides more revenue while shrinking the rich-poor gap. So far, so good. Let’s move on. The nation’s infrastructure is maintained mostly at the state and local levels, supported to some extent by the federal government… just like welfare and food stamps. So we need to think about state budgets and local budgets… not just the federal budget. And here we don’t have to get bogged down in detail. Fixing the infrastructure would be easy in theory. Once there’s a basic income given to all American adults, welfare and food stamps could be cut way back at the state and local levels… and that money could be redirected to fixing the infrastructure. Nothing complicated about that. A nice, easy solution. The serious problems associated with American prisons—overcrowding in for-profit facilities—would also be fixed easily and naturally once basic income is adopted. We could start closing prisons and releasing petty offenders, since petty crimes would all but disappear. The desperation and the stress of poverty that lead to crime in the streets would be alleviated once all adults are getting basic income. So… a basic income program in America makes good sense to me as a viable solution to the nation’s woes. I’ve probably overlooked a lot of important points and considerations, in which case I hope to hear from readers! This entry was posted in Politics and Economics, Society and ethics and tagged basic income, fixing the US infrastructure, mincome, rich-poor gap. Bookmark the permalink. My main point of concern was mentioned, but I think it might need to be addressed more thoroughly with this plan as a part of the bigger picture (and ultimately, it could save society more money). I’ve always been concerned about overpopulation – particularly among the poorer sections of society – and the economic and human cost it brings to us as a nation. How could we really, truly educate people to let them know that they should really try and limit their offspring to a healthier level? Would you support national legislation to advocate for smaller families? I know I would. Lots of single moms in poor communities are in desperate straits,,, no time or opportunity to find decent work, no opportunity for income besides prostitution. Welfare payments to support their kids seems like a godsend, and it becomes all too tempting to have more babies in order to get more support. With basic income. Instead of getting more money for more kids, a single mom would get the same fixed amount as any other adult American. It would certainly discourage her from having more kids for the wrong reasons. That bug in the system would be fixed by basic income, but it would take time… a generation or so. The moms who already have lots of kids might need some extra support in addition to the basic income payment. But in the long run, basic income would straighten out the mess and provide a good cushion at the poverty line.